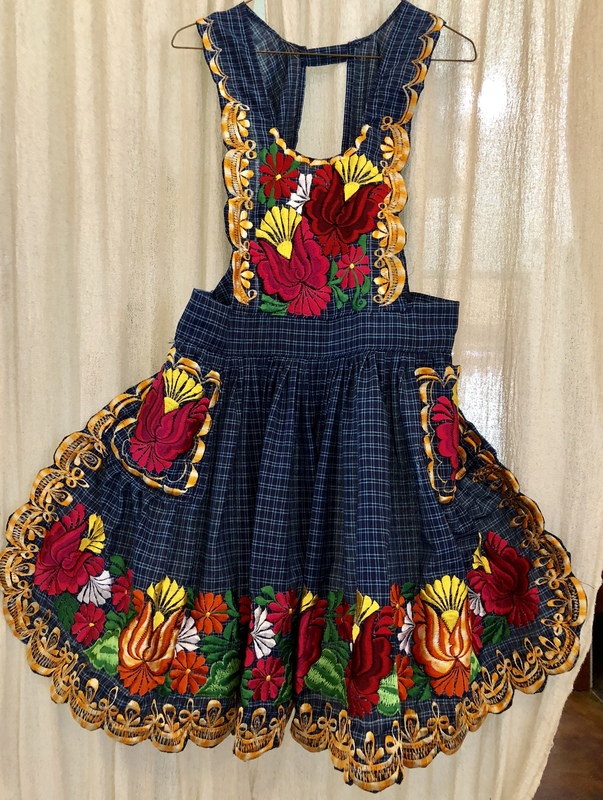 Oh, gosh, how to resist these extraordinary aprons of San Miguel del Valle. 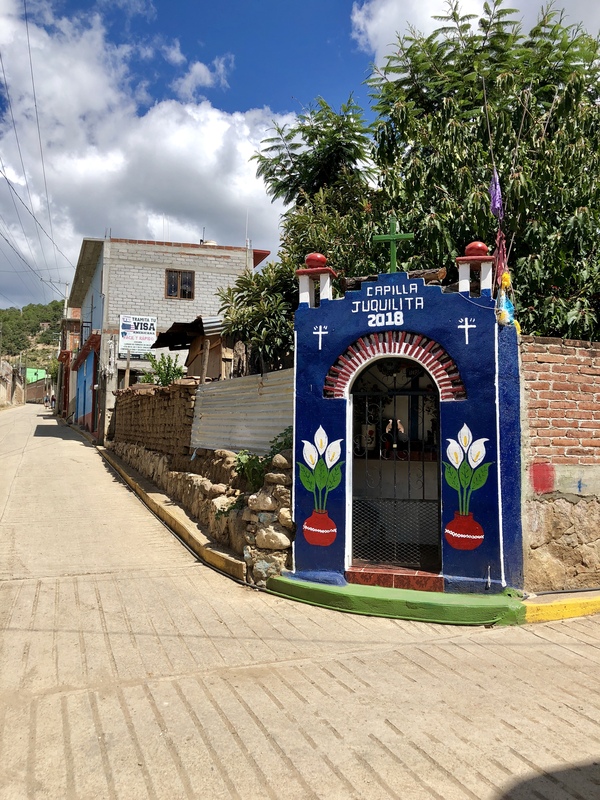 The Zapotec community is nestled into a steep hillside 8 km up into the Sierra Juarez from the Tlacolula crossroads on the way to Cuajimoloyas. Remote but accessible by car. Merry modeling the flounciest apron, which is for sale. 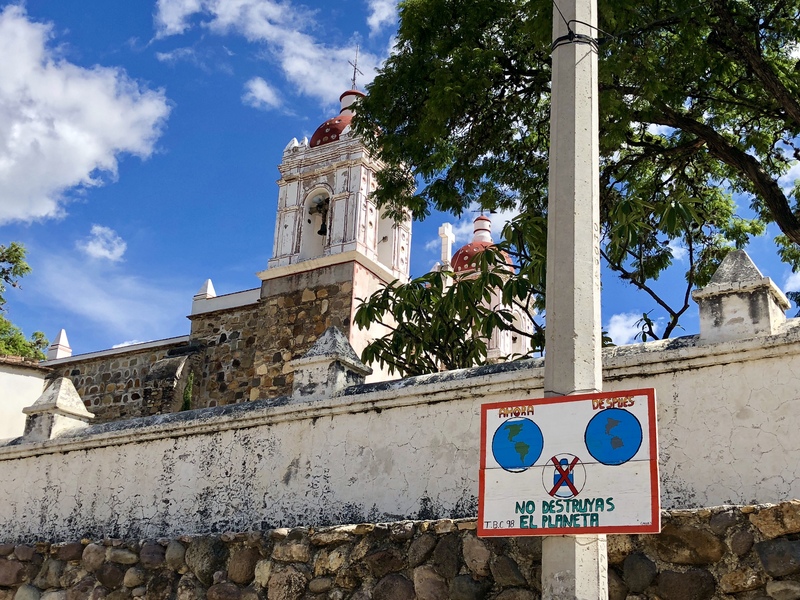 This is a small village of about 1,000 people many of whom are rug weavers that do contract work for Teotitlan del Valle resellers and exporters. Four Aprons For Sale, Below. But the fashion has turned to heavily embroidered flouncy aprons and this is becoming a more substantial part of the local economy. 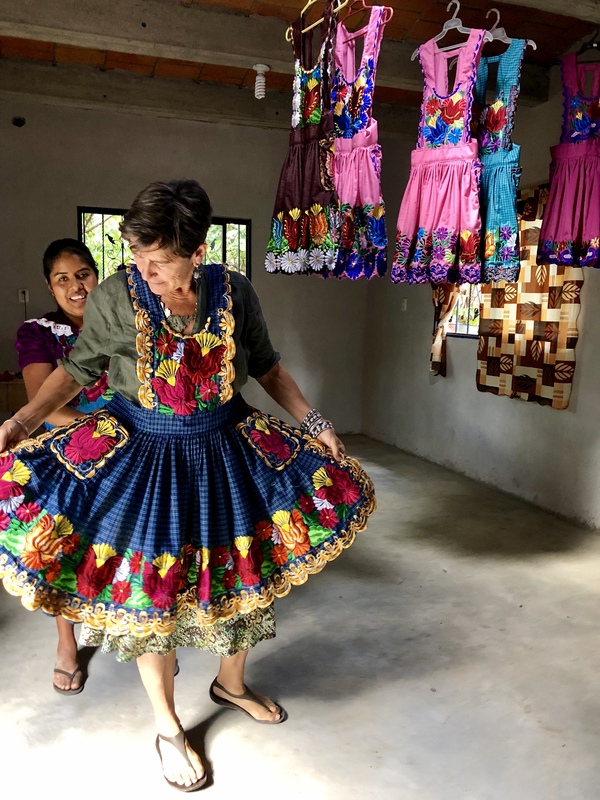 These are aprons for us to dance in, to wear to parties, to adorn oneself in the color Oaxaca is known for. 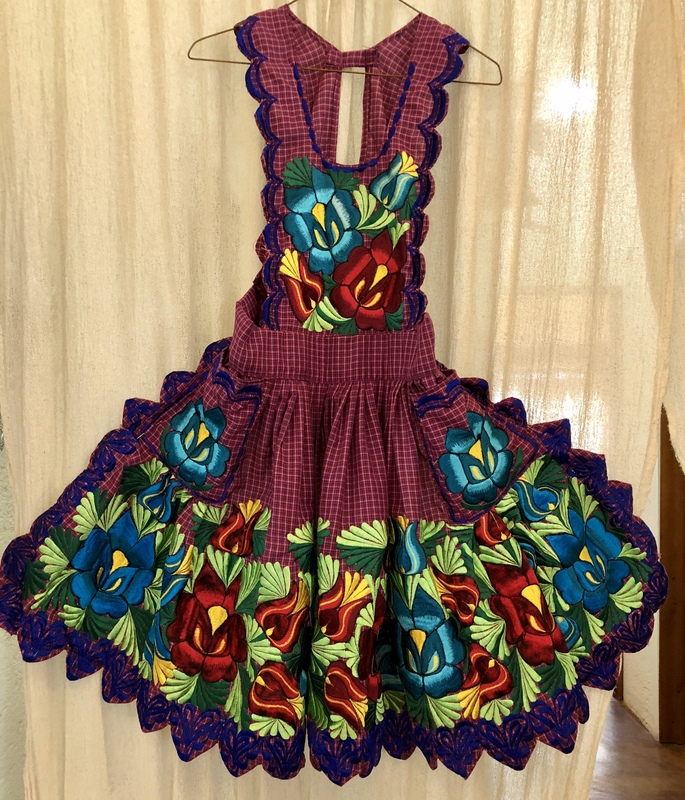 When I come back to Oaxaca from North Carolina in November, I’m going to have an apron party! Or, maybe I’ll have one in NC, too. 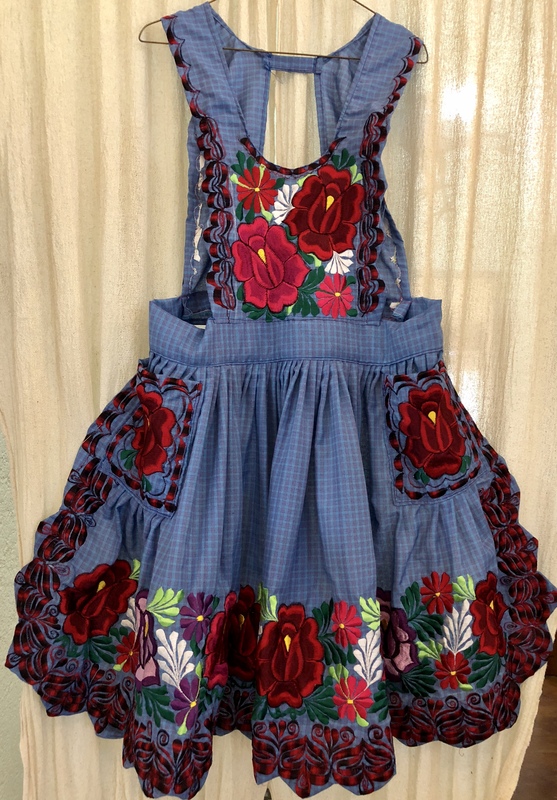 These are aprons with lots of gathers, pleats and tucks embellished with flowers and birds, scallops and pockets. They take hours to make even though they are machine embroidered. They take a seamstress of considerable skill to manipulate and change the threads, follow the curvature of the pattern drawn on cloth. No two are alike. I made my second visit to San Miguel just a few days ago with friend Merry Foss. I was on a quest to find an apron for Barbara Anderson. 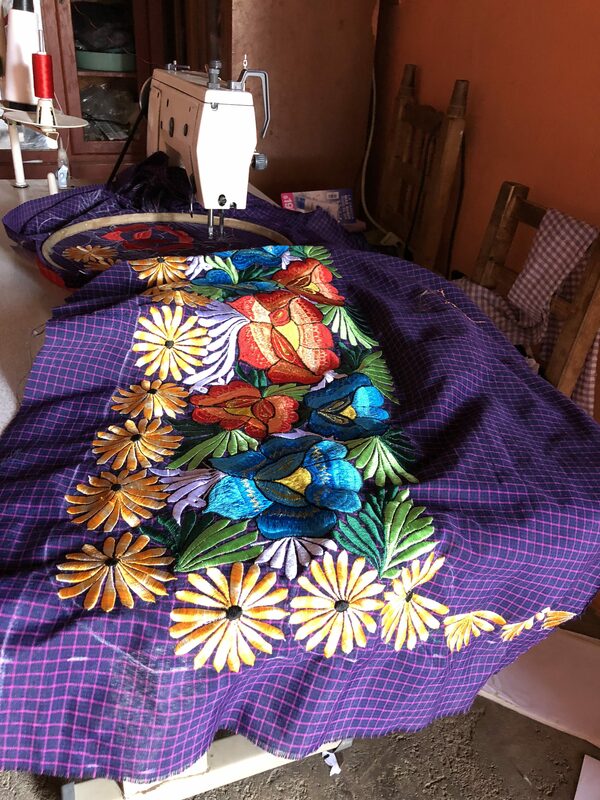 My first visit was a couple of weeks ago on an Envia Tour with Jacki Cooper Gordon, and I decided I needed to go back on my own, take my time to meander the streets and discover other apron-makers. Merry likes to meander just like me. When Barbara saw that Envia post, she wrote to ask me if I would find her an apron. I did at Epifania’s workshop. Fani and her husband both sew and embroider. This one, that I knew would be a perfect fit for Barbara, was sold. Someone in the village had given Fani a deposit to hold it for her. I said, sell it to me and make another one. She did. A bird in the hand, as they say. SOLD. #1 apron for sale, size M, $95 USD plus mailing. Now, full disclosure: The beauty is in the embroidery work. The cost is in the time to create the design and work it at the sewing machine. The fuller the embroidery, the more expensive the piece. Though, the finish work leaves much to be desired! Across all the workshops and on the best embroidered pieces, seams are unfinished and ragged. No pinking shears or sergers here. The pieces are sewn together quickly, it seems. SOLD. #2. For sale, size S-M. $85 USD plus mailing. Tell me the Number of the Apron that you want to buy. I will send you an invoice that includes apron and USPS priority mailing cost. 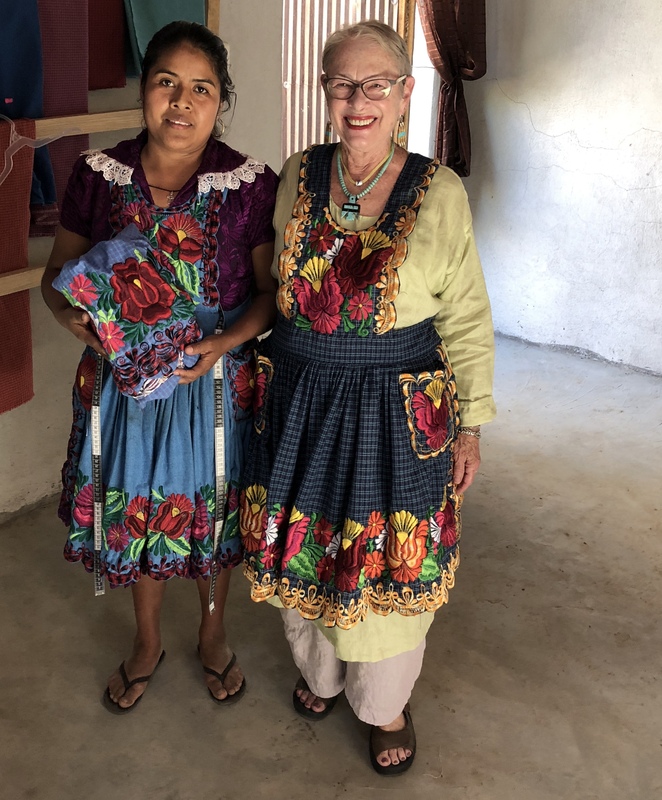 Finished seams and dangling threads are a problem for quality control throughout our Oaxaca region. But, these garments — as in many other towns — are made for the local women. It’s the embroidery that matters most to them. Many of these pieces are used for daily wear — washing, cooking, baby-tending, cleaning, going to market. So they get used up fast. Another version of FAST FASHION? Perhaps. Is it up to us to influence the quality of something in order to meet a global fashion demand? What changes in the process? SOLD. 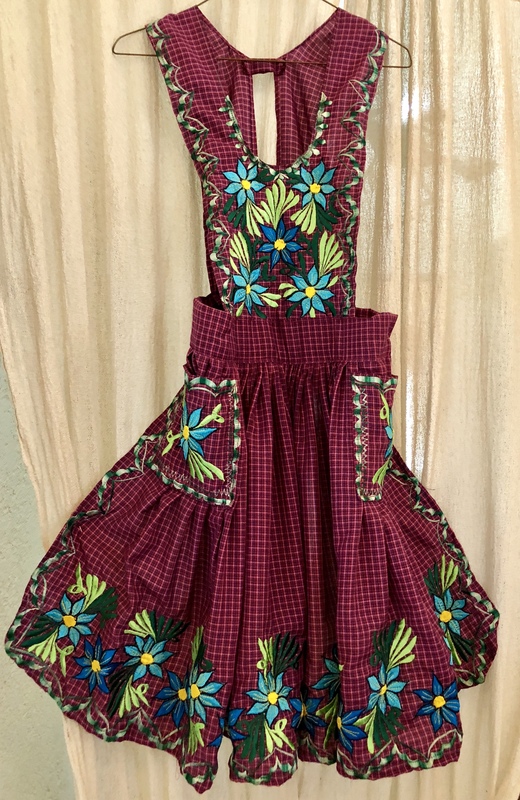 #3 apron for sale, size M-L, $95 USD plus mailing. Perhaps it’s only gringas like me who want a piece to last, with finished seams, edges that match, dangling threads clipped. I must confess, this type of fanciful, flouncy stitching is a departure for me, but it has also captivated me. Fun to wear. Frivolous. Brings a smile. The fabric can be a cotton-poly blend, or pure polyester or maybe even rayon. Not the best. Shiny — brillo — is what the women here like. Wash it, dry it fast, wear it again. My tendency is to go for natural dyes and hand-woven cloth. But, I’m smitten. #4 apron for sale, size S-M, $70 USD plus mailing. We arrived in San Miguel del Valle around 2 p.m. Just in time for comida — afternoon lunch. The fare of the day at Comedor Tere — an Envia supported enterprise — was fish. Mojarra to be precise. 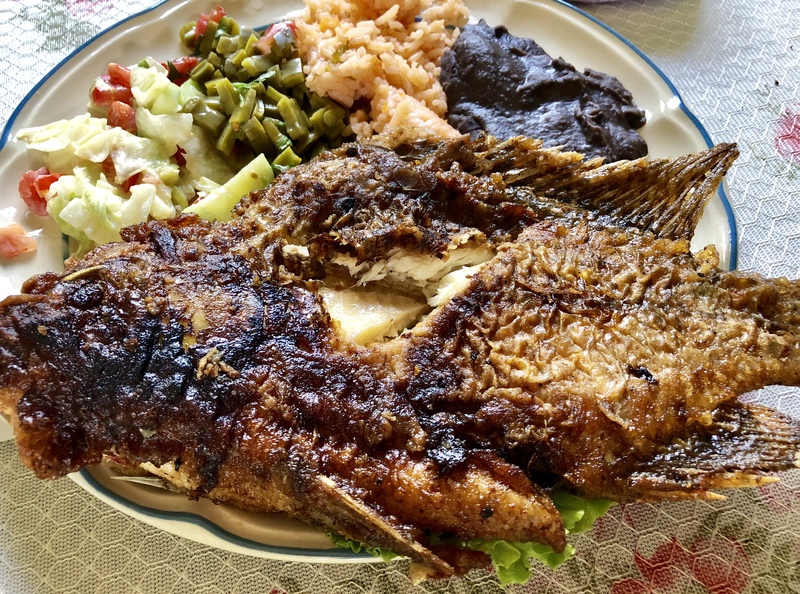 A whole fish, deep fried but not greasy, served with nopal salad, delicious black bean puree, rice, salad and homemade tortillas, plus a pitcher of fresh guava juice. Total cost for two, 100 pesos (that’s about $5 USD total, $2.50 each). Tere disinfects everything and I eat lunch with confidence. Meal of the day, mojarra, tender and moist. 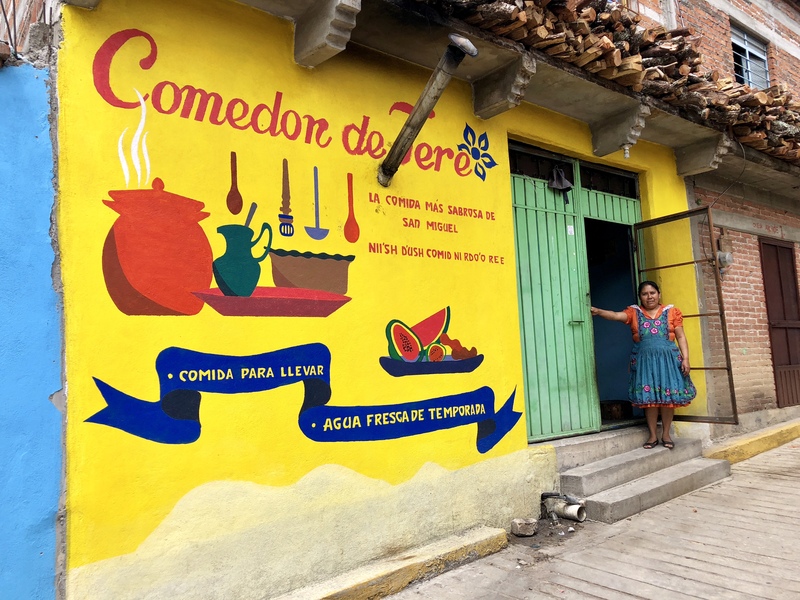 Tere used her interest free Envia loan to expand her hours and offerings, opening a family-style restaurant beyond the carry-out service she used to do exclusively. 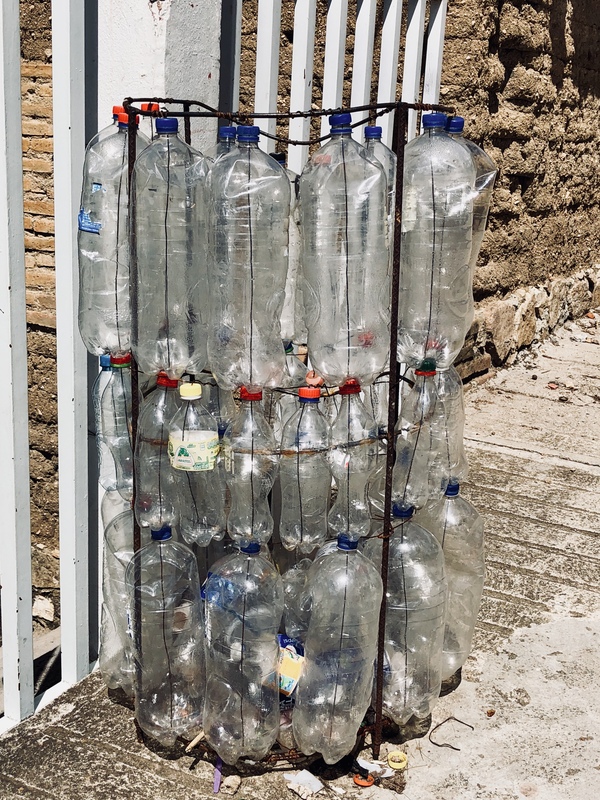 Recycled bottle recycling bin. Now that’s creative. In Mexico and anywhere, I find it’s important to have time to wander villages, meet people serendipitously and see what one can discover. Time and being open to a new experience gives us a chance to explore possibilities beyond the beaten path. It’s the approach I like to take on my tours, too. Keep enough open time to see what and who pops up! 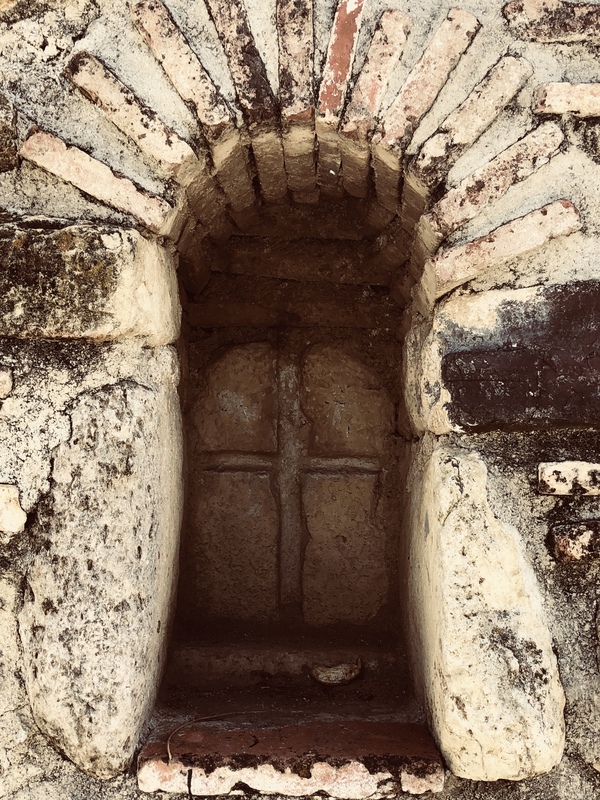 Niche in the church wall. How old is this? Centuries. 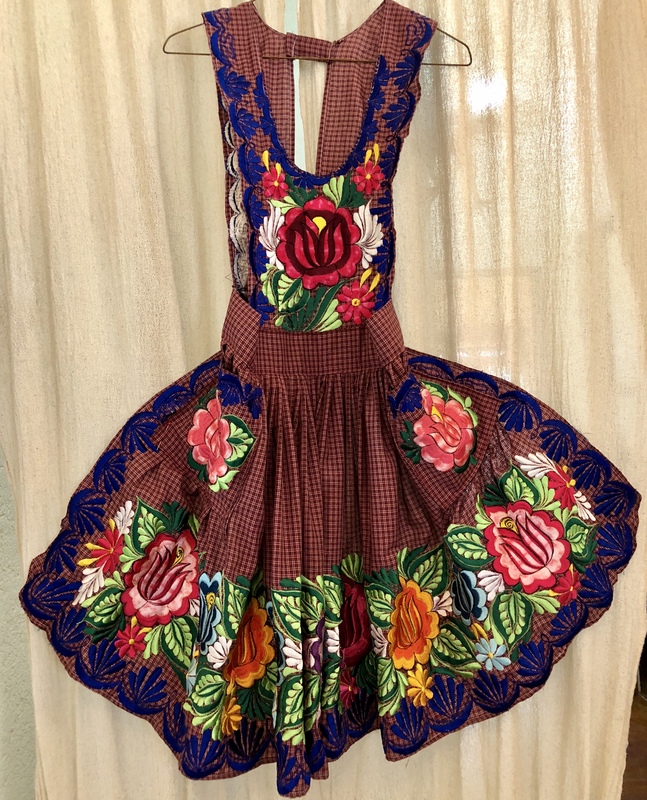 This entry was posted in Clothing Design, Cultural Commentary, Oaxaca Mexico art and culture, Travel & Tourism and tagged aprons, Mexico, Oaxaca, San Miguel del Valle. Bookmark the permalink. I want to buy Apron #3. Please send me a paypal invoice Norma! Invoice sent, Kristy. Thanks very much! This was so much fun to read, Norma. I’m looking forward to an EnVia tour next year. The aprons are adorable, although I already have too many textiles. However, I’m happy to learn of different trends, and to find out places where I might visit. I love your blog!